Duskie Estes & John Stewart opened zazu kitchen + farm in 2001. John and Duskie are committed to “knowing the face that feeds you”, buying from local farmers and farming themselves in 3 locations in Sonoma County and raising their own rabbits, ducks, chickens, goats, sheep, and pigs. They believe in the responsibility of their purchases and source ethical meats direct from farmer and respect the life given by using all parts “snout to tail”. They teach their cooks to butcher whole animal. Zazu was included in the San Francisco Chronicle’s Top 100 restaurants of San Francisco for 3 years and in San Francisco Magazine Top 50 restaurants. Zazu has been recommended in the San Francisco Michelin Guide 2008-2018. 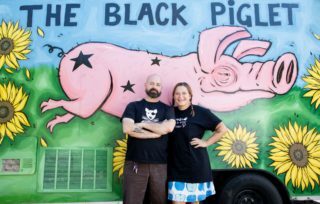 Both Zazu Kitchen + Farm and their food truck, The Black Piglet received Slow Food Snail Awards in 2017. Duskie & John were on the cover of Wine Spectator, received the Star Chefs’ Sustainability Award in 2009, and were crowned King & Queen of Pork at Aspen Food&Wine, 2011. Black Pig Meat Co. is known for it’s award winning bacon and salumi from pasture raised pigs and a product line that utilizes the whole animal – almond lip lardo, rose geranium lard lather, cider cracklins, rodeo jax – bacon caramel popcorn, swine sweets – chicharrone peanut butter cups, piggy pop – bacon toffee lollipop… Men’s Journal named it one of the TOP TEN BACON’s. John’s coppa won a GOOD FOOD Award in 2016 and his prosciutto won in 2019. They also make their own wines with Davis Family Vineyards and Thomas George Estates: PINK PIG sparkling wine, BLACK PIG PINOT, and Black Pig Slaughterhouse Syrah. Duskie began cooking at the age of five in her EZ-Bake oven. She is a graduate of Brown University. Growing up in San Francisco, she fell in love with everything restaurant through her weekly Wednesday night dinners out with her father. Duskie is known for being a fierce competitor on Food Network’s The Next Iron Chef, seasons 3 & 5 and for judging on Guy’s Grocery Games. zazu kitchen + farm was also featured on Food Network’s Diners, Drive-Ins, & Dives. Duskie and John moved to Sonoma County from Seattle where Duskie’s was the chef of Palace Kitchen in Seattle, where she was voted City Search’s Seattle Best Chef in 2000. Under her leadership, Palace Kitchen was rated by Gourmet magazine as one of the top twenty restaurants in the country in 2000. She was coauthor on Tom Douglas’s Seattle Kitchen, which received the James Beard Award in 2001. John Stewart is from Mt. Kisco, New York and grew up in the kitchen of his family’s four generation catering company, Thomas Fox and Sons, founded in 1919 by his great grandfather. He is a 1990 graduate of the University of Colorado at Boulder. John is an avid salumist studying at the University of Iowa Meat Lab. NextTom Schmidt | John Ash & Co.